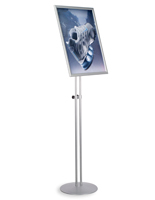 This sign stand is designed to meet all of your display needs in one product. The tall slim design enables users to place this sign holder in narrow passageways or busy entrances without being in the way. 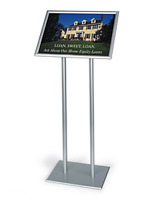 This sign stand, also known as a lobby display, features an adjustable height and tilting frame. 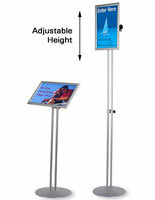 This enables users to customize this pedestal to suit the current need. 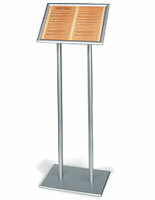 Each sign stand is made to hold 11" x 17" signs and menus. 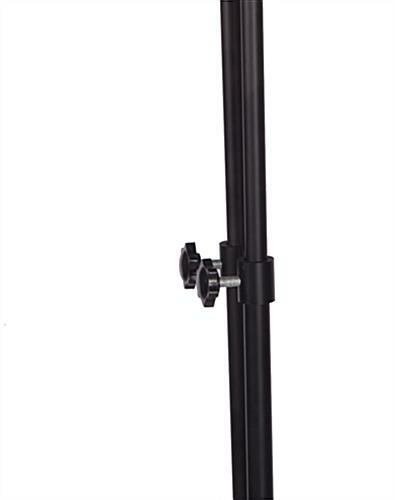 The body features a double metal pole stand, matching base and snap open frame for easy graphic changes. With a matte black finish and flip open edges, this sign stand is both stylish and easy to use. 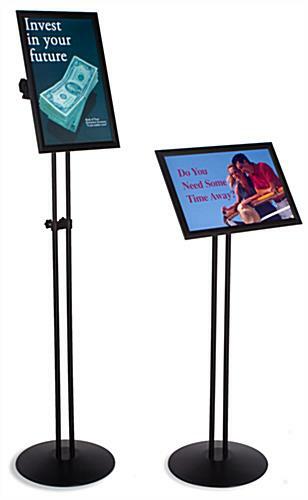 We provide this poster holder with an acrylic lens to protect your signs and reduce glare. 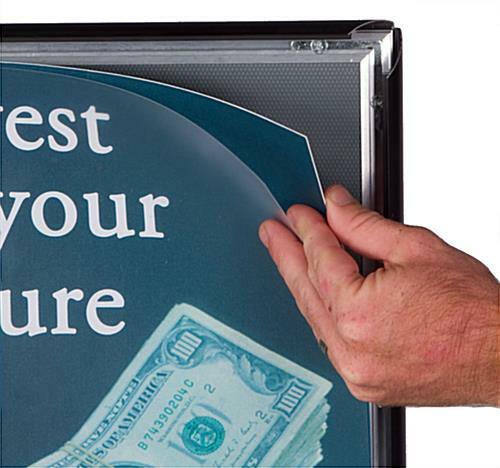 This sign stand adjusts in many ways for maximum flexibility and versatility. No additional tools are required to adjust the height or viewing angle. 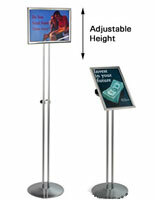 Each lobby display, sign stand features an adjustable height that can move up and down to a position that you choose. 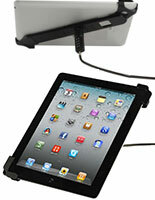 The print holder can be placed in the vertical or horizontal position, depending on the need. 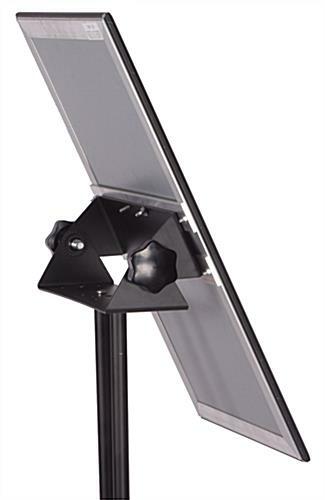 The sign stand frame also tilts a full 180 degrees to any desired viewing angle. Fully extend the height to use as a poster holder, or drop the height and tilt the frame back to use as a directory or menu display. 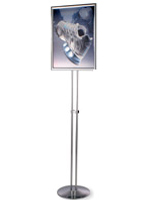 Whichever way you decide to use it, this sign stand will look great in any indoor location. I really like this display, it is heavier and sturdier than I expected, which was a nice surprise. It was slightly crooked when I put it together, but I was able to make a slight adjustment which fixed it. Assembly is super easy! The one negative thing I have to say is that the plastic protective cover insert is frosted for some reason. I used a dark (almost black) sign insert and when you use the frosted plastic cover, it ruins the black sign insert and makes it difficult to read. I'm currently looking for a clear plastic (non-frosted) protective cover to use instead. If you use a white or light-colored sign insert, I'm sure the frosted protective cover is just fine. Thank you for the feedback, Lisa! Just purchased. Very impressed with the quality and versatility. So much easier to insert the actual signs needed quickly and the ability to have it tilt at an angle. The stability is also a big plus as the sign is raised higher. Have a feeling we will be ordering more soon. Thank you for the feedback, Jay! This is a very versatile product which is good for a variety of uses - very sturdy and clean looking. We love this sign stand! We use it for all of our events at our restaurant, very versatile and super easy to use and assemble. In fact, this is the second one we've ordered!